An investor is someone who owns property for either personal or business purposes. 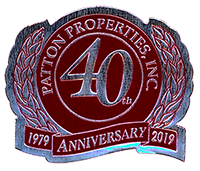 Whether you would just like to hand over the daily bookkeeping and management duties, or you wish to have the experience of property management professionals, we at Patton Properties, Inc. are here to take away that stress. Our qualified staff has incredible experience in handling, with the greatest care, your property maintenance, rent collection, and any other service associated with owning a rental. We inspect all properties prior to the agreement being signed, make maintenance suggestions and are able to perform the needed repairs. We also are prepared to periodically inspect the property to ensure the condition of each unit continues to meet the standards we have set. As your property manager, our goal is to achieve the highest market value for your property, while maintaining a high occupancy rate and keeping your expenses to a minimum. Vacancies translate into lost income which is something we try to avoid. We want to make sure that your property is advertised and marketed as effectively as possible. The rental process is designed to obtain the best possible tenant for each property. This can only be accomplished after a thorough check of the applicant's history. We screen and process applications and negotiate and enforce leases on a daily basis. Our policy is to require the minimum security deposit equivalent to one month’s rent (with approved credit). Deposit monies are kept in a trust account and are used at end of tenancy to pay for damages above normal wear and tear caused by abuse or neglect. A pet deposit is calculated at $200.00 times the number of pets allowed on the premises. Deposit monies are kept in a trust account and are refunded to the Tenant within thirty (30) business days after the premises has been vacated, if upon inspection, the premises are found to be in as good condition as at the beginning of the lease. Whether you are investing in additional properties or feel it is time to cash in on your investment, we will facilitate all aspects of the transaction. Acquisitions – Looking to add to your portfolio? We can help you identify the right properties and close the deal quickly and efficiently. Property Evaluation – Is your property ready to sell? We can help you maximize your sale price. Appraisals – You may ask, “What is my property worth?” We can give you the answer based on real market data. Income Management begins with prompt disbursal of monthly income (with statement) and continues with modern management strategies and proper maintenance on each property so as to obtain maximum rents and the best possible tenant for that unit. Our goal with our Income Management strategies is to eliminate the necessary effort by the investor. We want you to feel safe and secure that your property is well maintained, and that the most appropriate tenant will inhabit your property. We want you to remember that your rental property should be an asset to you and your family, not a constant problem. Columbia is located in the center of South Carolina at the junctions of Interstates 20, 26 and 77. It is South Carolina's most populated city, the state capital, the county seat of Richland County, the home of the University of South Carolina's main campus, and the site of the South Carolina State Fair each October. Columbia is just a little over 100 miles to the beautiful beaches of South Carolina in one direction or the foothills of the mountains in the opposite direction. Major regional shopping centers in the Columbia area include Columbiana Centre, Columbia Place and the Village at Sandhill, along with a handful of other smaller shopping centers in the region.The Five Points neighborhood, home to many locally owned businesses, is known as Columbia's eclectic village shopping area. The Devine Street corridor offers a variety of specialty shopping, including art and antiques, eclectic home furnishings, and men's, women's, and children's clothing. The historic Congaree Vista district downtown provides shoppers with a collection of shops filled with antiques, oriental rugs, jewelry, original artwork, hand-made furniture, and collectibles.